The revisions aim to increase the harvest of the invasive species, which preys on valuable shellfish such as softshell clams. Commercial fishermen no longer need a special license to harvest and sell green crabs and lobstermen can keep them as bycatch. There’s a great big target on the backs of predator green crabs now, thanks to rule changes by the Maine Department of Marine Resources that went into effect this week. 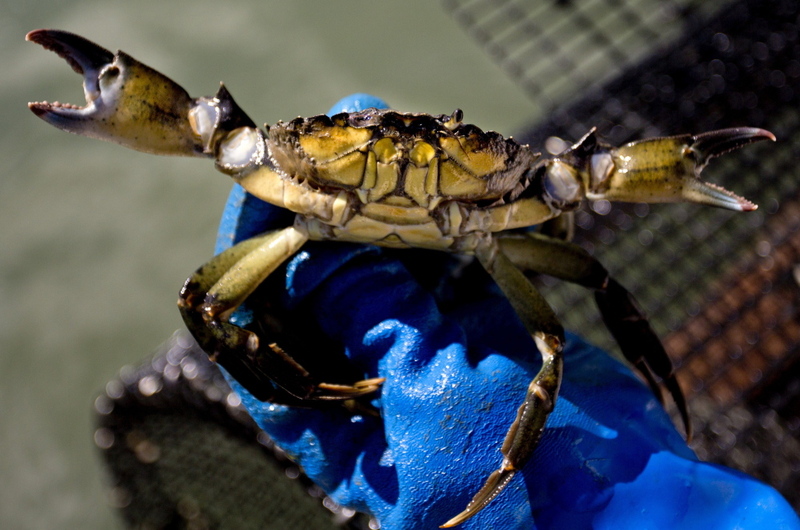 As of Aug. 10, commercial fishermen no longer need a special license to harvest and sell green crabs and don’t have to report their green crab harvests to the state. Lobstermen will now be allowed to take them as bycatch. 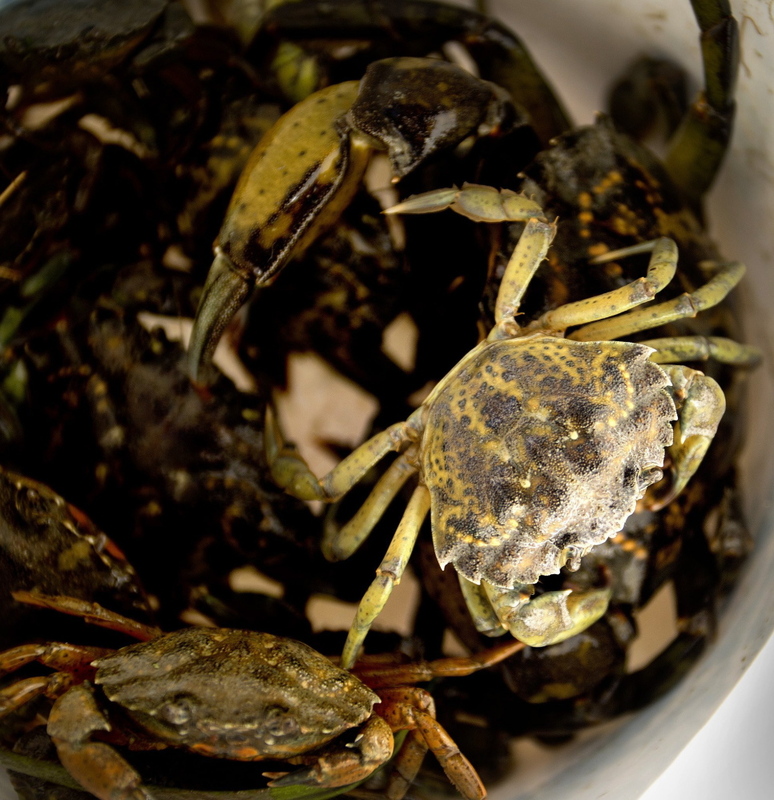 And when the Sheepscot, Damariscotta and Medomak rivers are closed for fishing other species of crabs between Dec. 1 and April 30, fishermen will still be able to harvest green crabs from those waters. Public and private efforts are underway to rid Maine’s coastal waters of the invasive species, which preys on the state’s valuable shellfish population and wreaks havoc on eel grass. Although the crustaceans, which can be anywhere from 2½ to 5 inches long, have been reported in Maine for more than a century, scientists speculate that warming ocean temperatures have allowed the crabs to multiply. The crabs feast on bivalves such as softshell clams, which are Maine’s third most lucrative fishery. In 2013, 10.6 million pounds of softshell clams were valued at $16.9 million. But that was down from 11.1 million landed in 2012, according to the DMR, a decline partly attributable to damage from green crabs. In December, hundreds of researchers gathered at the University of Maine in Orono to discuss the issue at a Green Crab Summit. In February, Gov. Paul LePage ordered the creation of a task force to study their impact and potential solutions. A a result, Brunswick, Freeport, West Bath and Harpswell are studying the most effective ways to trap green crabs. As awareness about the problem has grown, so has the effort to harvest crabs. In 2013, there were 52 licenses to fish green crabs, and 10,596 pounds were harvested, according to preliminary data from the DMR. The year before, 36 licenses were issued and 3,762 pounds landed. Meanwhile, entrepreneurs are exploring opportunities to turn the predators into profits by marketing green crabs for everything from fish food to gourmet meals. “The rule changes certainly makes things easier,” said Dan Devereaux, a Marine Resources officer in Brunswick. In the last year, researchers have been working at monitoring the green crab population with an eye toward managing it. Marine biologist Darcie Couture, who is studying the green crabs in Brunswick and Harspwell, said that her team saw the population of green crabs peak in July. The catch is now starting to taper off closer to shore, but in deep waters off of Harpswell, the harvests are still large. “We’re still pulling out hundreds of pounds each week,” said Couture, a signal to her that there’s a sustainable population in deep water. Last year they didn’t see green crab catch numbers fall until winter. The hope is that the pattern that’s emerging this year will repeat itself next year so researchers can identify a distinct “green crab season.” That would allow fishermen and towns to prepare for it by putting traps in strategic places to protect their shellfish resources in the spring, and keep traps there until the end of the season. Brian Beal, a marine ecology researcher at the University of Maine at Machias, has been doing a series of studies in Freeport, tracking crabs and assessing how they’re affecting clams in the area. In Freeport, the green crab catch is below levels they saw last year, and that the weight of average catch per trap is less than 1 pound. Couture said the attention has spawned a stream of calls from entrepreneurs who are looking at potential new markets for the pesky creatures. Some are looking for new ways to process the crabs to capture their meat and others are looking at new uses for their shells and other components. Margaret Harrington, manager of Harrington Bait in Woolwich, hopes that one of those commercial uses will be bait. Her store sells bloodworms and sandworms, and she sees a steady demand from fishermen who want green crab as bait. If there’s a viable market, she said she would consider building a processing operation. “We’re always interested in expanding what we’re able to sell,” she said.